After ruling the smartphone market in Pakistan, Huawei has set its eyes on a smart and healthy lifestyle. With a host of smart products in the pipeline, the company is introducing an innovative smartwatch called the HUAWEI WATCH GT – a product that embodies adventure, intelligence and style. The HUAWEI WATCH GT perfectly mixes classic elements of a watch with a large screen, and battery that runs up to two weeks. It features ultra-long endurance, lower power consumption, more professional exercise monitoring and scientific guidance making it a must-have “outdoor smart watch” for urban explorers. 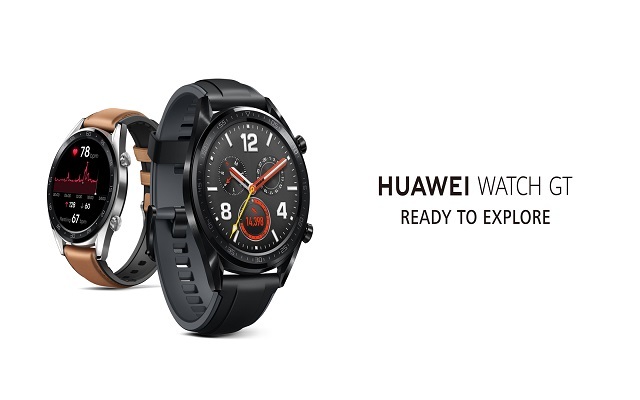 After winning the hearts of Pakistanis with its innovative smartphones, Huawei is bringing more smart products to the market beginning with HUAWEI WATCH GT – a perfect blend of elegance and intelligence. Huawei entered the smart wearables market in March, 2015 with the launch of its first-generation Android-powered smart watches. Since then, the company has been at the forefront of innovation and today, brings the HUAWEI WATCH GT with more sophisticated technology than ever before. It wishes to usher a healthy lifestyle in Pakistan, since people here are drawn towards sports and adventure in droves. HUAWEI WATCH GT takes inspiration from Gran Turismo (GT) emulating a luxurious and power-packed performance for people who have an adventurous spirit. With its pioneering Artificial Intelligence (AI) and UI design featuring multi-color health data design, exquisite fonts, scenario-based display and professional graphics, HUAWEI WATCH GT vividly endows a sense of vitality, and modernism. It has a 10.6mm thick compact body with a 1.39’’ AMOLED HD touch color screen comprising a full circle dial, bezel, crown, and ear. The smartwatch is an auxiliary and extension product of a smartphone that acts as an intelligent assistant for users during hiking, walking, running, cycling, swimming, free training, working and sleeping. If that isn’t convenient enough then we don’t know what is! The smartwatch is enriched with a multi-color dial-design and an advanced User-Interface (UI). It depicts various health data and scenarios in different colors, like: Red color for heart rate with a beating heart to depict rhythm while yellowish orange color stands for progress on attainment of goals. The color Purple depicts sound sweet sleep and Green stands for health, vitality and sports interface.